Welcome to the "Official Dry Cleaner of Busy People Everywhere"
1-800-DryClean is America’s premier dry cleaning and laundry pick up and delivery service. While we have locations from coast to coast, your 1-800-DryClean is a locally owned and operated business built on a reputation of providing personalized service to customers just like you. Whether you are a busy professional or a parent on-the-go or both, you're sure to benefit from the services of 1-800-DryClean. 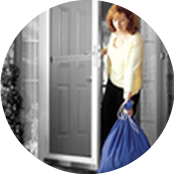 We create your personal cleaning preference profile and give you your water-resistant 1-800-DryClean Bright Blue Bag and door hook. Your garments are professionally cleaned right in your neighborhood for the fastest turn around possible. To get started just enter your zip code above to find your local 1-800-DryClean. We'll take care of the rest. Click here to sign up and join our email club and receive news and special offers!